Caucasus. 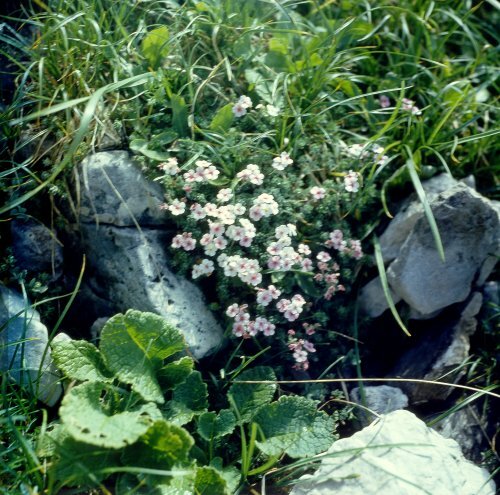 In alpine and subalpine regions, on rocky, chalky and steppe slopes and screes at 1,400-3,000 m.
Plant forms a cushion or a small mat. Rosette leaves overwintering, lanceolate, 7 mm x 1 mm, grey-green, densely silky-pubescent. Flower stalks 3-6 cm, hairy. Flowers 3 to 6 in umbels, 8-12 mm diam., pink-purple or milk-white. V - evergreen, new growth beginning in early spring, a second flush of leaves in summer (July). Fl - May-June, for three weeks but in southern regions April. Fr - June, July. P - by seed or cuttings. Requires a protective cover in northern regions. Z 5. New. Central Asia (Tien Shan, Pamiro Alay). Cushion dense. Cushion dense. Leaves small, lanceolate, silver-green. Umbel with 6 to 10 white-pink flowers 7-8 mm across. Good for the rock garden. Z 4. New. Cushions small, very dense. Leaves small, grey green. Flowers solitary, pink with white tinge, 4 mm diam. Requires dry gravelly soil. Good for the rock garden. Z 4. New. Mountains of southern Siberia and adjacent regions of Central Asia, Mongolia. Mat-forming plant with numerous branched stems. Leaves small, grey-green. Flowers small, 1 to 3 in an umbel. Very well suited to the rock garden. Z 4. New.